noticed her son watching YouTube videos of people playing the piano, then running through their Warren home out to the Florida room, where his keyboard was set up, and playing the song note for note. Dylan begged Maureen to stop so they could take a look. That life-changing day was when the Sanzenbacher family met Thomas Solich, owner of Solich Piano. With three locations — Woodmere, Boardman and Columbus — the company has made music education and spreading the gift of learning to play the piano its mission. Dylan Sanzenbacher is now a sophomore music education student at Baldwin Wallace University’s Conservatory of Music. The benefits of music education in childhood have been proven time and time again. According to National Association of Music Merchants Foundation, children who study music achieve larger vocabularies and more advanced reading skills, higher standardized test scores, and higher attendance rates, among other things. “We see such a correlation between music and math, music and medicine, music and the STEM fields,” he says. “Music truly helps at every stage, from when a child is developing in the womb, after being born, and all the way up through adult life. Music develops all sorts of different parts of the brain. “I think that we’re doing our children a huge disservice if we don’t give them structured music in the same way we give them math or reading or science,” Solich adds. After a couple of years taking lessons with Solich, and then with a professor from Baldwin Wallace University, Dylan did receive a music scholarship and is now a sophomore music education student at Baldwin Wallace University’s Conservatory of Music. Dylan says he would like to become either a music educator for middle or high school band students, or continue his music education with a graduate degree in conducting, or music history and literature. Thomas Solich, owner of Solich Piano. While music in general offers benefits for children, piano in particular is a good place to begin, according to Solich. He explains that piano is an orchestral instrument, meaning it’s the only instrument that can be played without having other instruments join in, where it can virtually be the orchestra because of the use of the player’s 10 fingers. Even in today’s high-tech society, where teachers and parents compete with the distraction of screens, pianos are still relevant. Kids are getting screen time while they’re learning music, forming a way to “bridge this gap of antiquity,” Solich notes. Solich also advises parents not to give up if their child doesn’t immediately show a musical talent. The Solich Piano showroom in Woodmere. 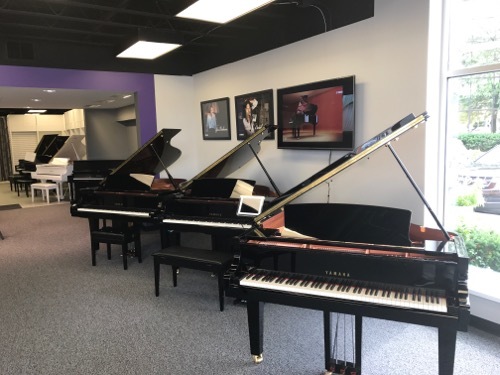 Solich Piano opened its Cleveland-area flagship showroom earlier this year. Located at 27730 Chagrin Blvd., the showroom features a display of more than 50 pianos and keyboards. Phase two of the renovation, starting this summer, will incorporate an intimate recital area with 75 seats in the center of the store for high-quality concerts, student recitals and master classes by a wide variety of musicians. The facility will also offer group and private lessons for all ages and levels. He adds that the Solich staff can help match parents with not only the right instrument (if they’re piano shopping), but also the right music instructor – throughout the greater Cleveland/Akron area – to fit the type of lessons desired and match the goals that parents have for their child. Solich Piano is the exclusive Yamaha and Bosendorfer piano dealer for Northeastern Ohio. For more information, visit solichmusic.com, call 216-831-1044, or email [email protected].